These terms and conditions fall under the laws on the Province of Alberta, Canada. With a purchase from Sawmill Restaurant. To enter by completing a survey, you must be invited by a participatingSawmill Restaurant by being given a survey response card or other invitation at a participating location. The website address is provided on the survey invitation. Some questions on the survey are mandatory, which are indicated. I would like to enter into the Sawmill Restaurant prize draw for the chance to win a “[state prize offered]” on a sheet of paper. This sheet must also include your full name, home telephone number including area code, and full mailing address. No printed letters, facsimiles or photocopied entries will be accepted. All successful respondents must correctly answer a skill testing question in order to claim their prize. All respondents must be of legal age and a legal Canadian or USA resident. All respondents must not live with, or have in their immediate family, a parent, child, sibling and spouse of any of the foregoing) who is an employee, representative, or agent of Sawmill Restaurant or any of its subsidiaries, licensees or affiliates. All partially or fully completed surveys become the property of the PerformaLogics Inc. and will not be returned. By entering, entrants agree that Sawmill Restaurant shall not bear any liability for, and entrants agree to release, indemnify and hold Sawmill Restaurant harmless from any injuries, losses, damages, claims, actions and any liability of any kind resulting from participation. Void where prohibited or restricted by law. By entering this contest, contestants agree that Sawmill Restaurant shall not bear any liability for entries which are lost for any reason, incomplete, illegible, or due to the failure of the website or technical problems. (including, in the case of on-line entries, injury or damage to any telephone network or lines, on-line systems, servers, access providers, computer equipment or software) or resulting from downloading any material from the Sweepstakes website. The type and value of the prize will depend on the Sawmill Restaurant survey. This is stated on the survey invitation and on the website for each Sawmill Restaurant survey. All prizes and not transferable and carry no warranty. Lost or stolen prizes will not be replaced. Any taxes or other implications as a result of receiving a prize are the sole responsibility of the winner. Sawmill Restaurant is not responsible for the loss of this prize for any reason and is not liable for the any property damage or personal injury in any way attributable to this contest except where prohibited by law. Each person will be eligible to win a maximum of one (1) prize every 30 days. Excess survey completions or mail-in entries will be deleted for purposes of the draw. A person must correctly answer a mathematical skill-testing question in order to be eligible to receive a prize. Should a person fail to correctly answer the skill testing question, or should the prize go unclaimed, no alternative winner will be chosen. Persons who are selected to receive a prize will be contacted by telephone within three (3) business days of the draw. They must sign and return a release of liability within seven (7) days of receipt of the release. If the selected person cannot be contacted by telephone or email within seven (7) days, they will forfeit the prize. All entries become the property of Sawmill Restaurant who assumes no responsibility for lost, stolen, delayed, damaged or misdirected entries or for any failure of the website, for any problems or technical malfunction of any telephone network or lines, computer on-line systems, servers, access providers, computer equipment, software, failure of any entry to be received by Sawmill Restaurant on account of technical problems or traffic congestion on the Internet or at any website, or any combination thereof including any injury or damage to an entrant’s or any other person’s computer related to or resulting from playing or down loading any material in the promotion. 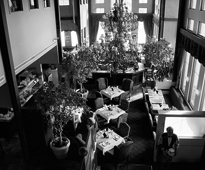 Sawmill Restaurant reserves the right, in its sole discretion, subject to the approval of the RACJ in Quebec, to cancel, modify or suspend the entry form download portion of this Sweepstakes should a virus, bug or other cause beyond the reasonable control of Sawmill Restaurant corrupt the security or proper administration of the Sweepstakes. In the event of cancellation, termination or suspension, at its discretion, Sawmill Restaurant shall select winner from eligible, non-suspect entries received prior to event requiring such cancellation, termination or suspension. Any attempt to deliberately damage any web site or to undermine the legitimate operation of this promotion is a violation of criminal and civil laws, and should such an attempt be made, Sawmill Restaurant reserves the right to seek remedies and damages to the fullest extent permitted by law, including criminal prosecution. Surveys obtained through fraudulent means or through an abuse of the Sweepstakes or any surveys that are in any way tampered with, forged, mutilated, illegible, incomplete or mechanically reproduced may, at the sole discretion of Sawmill Restaurant, be disqualified. In the event that, due to a printing, production or other error, more than the advertised number of prizes are claimed, there will be a random draw conducted amongst all eligible prize claimants to award the correct number of prizes after the Sweepstakes End. Except as provided herein, the personal information you are providing to enter this any draw will be used only to administer the draw unless you indicate otherwise. To receive a winners list send a self addressed envelope to PerformaLogics Inc, 240, 5718 1A St SW, Calgary, AB, T2H 0E8 within 30 days of the end of the program. You must specify the applicable Prize for which you are requesting a winner’s list. The winner list will be sent after the prize has been awarded. Sawmill Restaurant reserves the right, subject to applicable law, to terminate the program at any time. By entering, contestants agree to abide by these rules. This contest is subject to all applicable Federal, Provincial and local Municipal Laws.